^ Ricardo Munoz; Victor Morell; Peter Wearden (August 2009). Critical Care of Children with Heart Disease: Basic Medical and Surgical Concepts. Springer. pp. 326–. ISBN 978-1-84882-261-0. http://books.google.com/books?id=AYZ-Y2H5UeIC&pg=PA326 2014年2月26日閲覧。. ^ Norwood, WI; Lang, P; Casteneda, AR; Campbell, DN (October 1981). “Experience with operations for hypoplastic left heart syndrome.”. The Journal of thoracic and cardiovascular surgery 82 (4): 511–9. PMID 6168869. ^ Norwood, William I.; Lang, Peter; Hansen, Dolly D. (6 January 1983). “Physiologic Repair of Aortic Atresia–Hypoplastic Left Heart Syndrome”. New England Journal of Medicine 308 (1): 23–26. doi:10.1056/NEJM198301063080106. PMID 6847920. ^ Mahle WT, et al., Survival After Reconstructive Surgery for Hypoplastic Left Heart Syndrome: A 15-Year Experience From a Single Institution., Circulation. 2000 Nov 7;102(19 Suppl 3):III136-41. ^ Ishino K, et al., The modified Norwood procedure for hypoplastic left heart syndrome: early to intermediate results of 120 patients with particular reference to aortic arch repair., J Thorac Cardiovasc Surg. 1999 May;117(5):920-30. 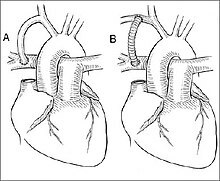 ^ Sano S, et al., Right ventricle-pulmonary artery shunt in first-stage palliation of hypoplastic left heart syndrome., Semin Thorac Cardiovasc Surg Pediatr Card Surg Annu. 2004;7:22-31. ^ A. Corno; Gigi P. Festa (8 December 2008). Congenital Heart Defects. Decision Making for Surgery: CT-Scan and Clinical Correlations. Springer. pp. 123–. ISBN 978-3-7985-1718-9. http://books.google.com/books?id=w3qCBeQSFDAC&pg=PA123 2014年2月26日閲覧。. ^ Lamberti JJ, et al., The Damus-Fontan procedure., Ann Thorac Surg. 1991 Sep;52(3):676-9. ^ Laks H, et al., Damus-Stansel-Kaye procedure: technical modifications., Ann Thorac Surg. 1992 Jul;54(1):169-72. ^ Joanna H. Davies; Lynda L. Hassell (30 October 2007). Children in Intensive Care: A Survival Guide. Elsevier Health Sciences. pp. 72–. ISBN 978-0-443-10023-9. http://books.google.com/books?id=2x8qIBjYRzgC&pg=PA72 2014年2月26日閲覧。. ^ Dähnert, I.; Riede, FT.; Razek, V.; Weidenbach, M.; Rastan, A.; Walther, T.; Kostelka, M. (Oct 2007). “Catheter interventional treatment of Sano shunt obstruction in patients following modified Norwood palliation for hypoplastic left heart syndrome.”. Clin Res Cardiol 96 (10): 719–22. doi:10.1007/s00392-007-0545-5. PMID 17609848. ^ Sano, S.; Ishino, K.; Kawada, M.; Arai, S.; Kasahara, S.; Asai, T.; Masuda, Z.; Takeuchi, M. et al. (Aug 2003). “Right ventricle-pulmonary artery shunt in first-stage palliation of hypoplastic left heart syndrome.”. J Thorac Cardiovasc Surg 126 (2): 504-9; discussion 509-10. PMID 12928651.